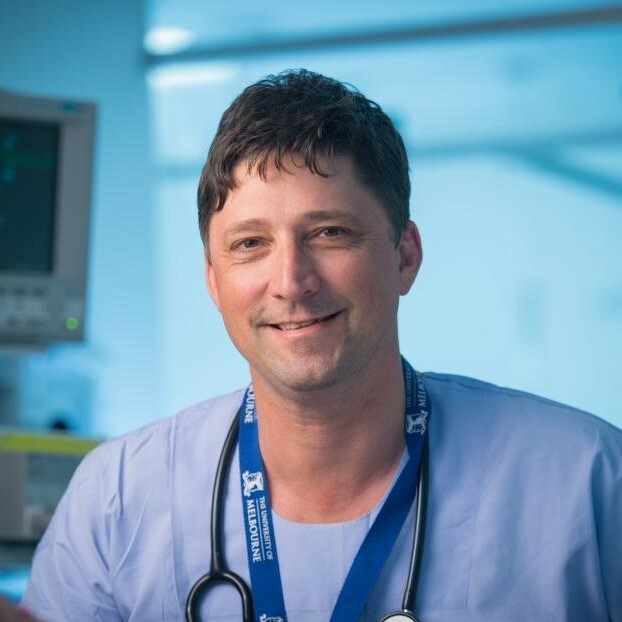 The Anaesthesia, Perioperative and Pain Medicine program of the Centre for Integrated Critical Care promotes multi-centre research with the Departments of Anaesthesia at the 15 hospitals affiliated with the University. APPMU also engages in collaborative and translational research with other clinical and biomedicine departments, and with the Clinical Trials Network of the Australian and New Zealand College of Anaesthetists (ANZCA). Areas of particular interest include measures to improve long term patient recovery after surgery through evidence-based perioperative care and pain medicine. NHMRC Project Grant (APP1160191) 2019. Riedel B, Story D, Heriot A, Wright G, Braat S, Sessler D, Buggy D, Tran-Duy A, Hiller J. Volatile Anaesthesia and Perioperative Outcomes Related to Cancer (VAPOR-C Trial). $4,800,000 over 5 years. NHMRC Project Grant (APP1162362) 2019. Leslie K, Painter T, Devereaux PJ, Peyton P, Corcoran T, Chan M, Short T. Tranexamic acid and hypotension-avoidance to prevent death and major complications after noncardiac surgery (PeriOperative ISchemic Evaluation-3 – the POISE-3 Trial). $1,192,127 over 5 years. Seqirus 2019. Nimo B, Yap C, Braitberg G, Story D, Welton R, Knott J, Parker A, Braat S, Eade. A.Survey of National Attitudes and Knowledge in Envenomation (The SNAKE Study). $100,000 over 2 years. Vifor, Austin Health 2019. Miles L, Story D, Riedel B, Burbury K, Burgess A, Braat S. Non Anaemic Iron Deficiency and Treatment Outcomes after Colorectal Cancer Surgery (The NATO Study). $100,000 over 3 years. Australian and New Zealand College of Anaesthetists Academic Enhancement Grant, 2018. A/Prof Alicia Dennis, Royal Women's Hospital. A haemodynamic and cardiovascular research program in obstetric anaesthesia and obstetric critical care at The Royal Women’s Hospital. Australian and New Zealand College of Anaesthetists Novice Grant 2018. Dr Ned Douglas, Royal Melbourne Hospital. High flow humidified nasal oxygen to prevent desaturation during EBUS - a randomised controlled trial. Australian and New Zealand College of Anaesthetists Project Grant, 2018. Prof Guy Ludbrook, Prof David Story. Extended Post-Anaesthesia Care – a feasibility study. Australian and New Zealand College of Anaesthetists Project Grant, 2018. Prof Bernhard Riedel, Peter MacCallum Cancer Centre. Volatile Anaesthesia and Perioperative Outcomes Related to Cancer: The VAPOR-C Trial (Feasibility Study). Australian and New Zealand College of Anaesthetists Project Grant, 2018. Dr Forbes McGain, Western Health. Capturing anaesthetic gases; an exploration of the chemistry and chemical engineering required to capture and potentially reuse sevoflurane. Australian and New Zealand College of Anaesthetists Project Grant, 2018. Dr Jai Darvall, Prof Kate Leslie, Royal Melbourne Hospital. A randomized non-inferiority trial of chewing gum versus ondansetron to treat postoperative nausea and vomiting in female patients after breast and laparoscopic surgery (The Chewing Gum Study). Australian and New Zealand College of Anaesthetists Project Grant, 2018. Dr Tuong Phan, St Vincent's Hospital. Optimisation of Perioperative Cardiovascular Management to Improve Surgical Outcomes II “OPTIMISE II” - AUSTRALIA. Australian and New Zealand College of Anaesthetists Project Grant, 2018. Dr Lachlan Miles, Austin Health. A prospective observational study examining the impact of iron deficiency on patient outcomes after cardiac surgery. Australian and New Zealand College of Anaesthetists Project Grant, 2018. Dr Lachlan Miles, Austin Health. Impact of non-anaemic iron deficiency correction on exercise capacity and perioperative outcomes in colorectal cancer surgery (ADEPT). NHMRC Project Grant (APP1120848) 2017. Peyton P, Leslie K, Story D, Myles P, Chan M, Schug S, Evered L, Braat S. Reduction Of Chronic Post-surgical Pain with Ketamine – ROCKet Trial. $4,800,000 over 5 years. ANZCA Melbourne Emerging Anaesthesia Researcher Award 2016. Dr Lachlan Miles, Austin Health. Iron Therapy for Non-Anaemic Iron Deficiency in Perioperative Colorectal Malignancy (FeRIC-II). Australian and New Zealand College of Anaesthetists Novice Investigator Grant, 2016. Furyk C (Story D, supervisor). Prehabilitation of frail patients undergoing elective colorectal surgery - a feasibility pilot study. Office of Research Ethics and Integrity, The University of Melbourne, Ethics and Integrity Development Grant, 2016. Woodward-Kron R, Hughson J, Parker A, Bresin A, Hajek J, Knoch U, Phan T, Story D. Let’s talk about medical research: Research equity for Culturally and Linguistically Diverse (CALD) older patients. Western Health Research Grant 2016. Daly JO, Bennett J , Ostaszkiewicz P, Story D, Joyce D. MINisling Insertion in Ambulatory settings under Local anaesthetic (MINImAL) feasibility study: A qualitative study comparing patient attitudes to three modes of anaesthesia for the insertion of mid-urethral slings to treat women with stress urinary incontinence. Australian and New Zealand College of Anaesthetists, Academic Enhancement Grant, 2015. Story, D. Emerging Projects for the Anaesthesia, Perioperative and Pain Medicine Unit (APPMU) at The University of Melbourne. ANZCA Melbourne Emerging Anaesthesia Researcher Award 2015. Dr Hugh Taylor, Western Health. A pilot study to investigate post ­‐operative oxygen consumption (POpOC) after colorectal surgery requiring bowel resection. Australian and New Zealand College of Anaesthetists Trials Network Pilot Grant 2015. Allen M, Parker A, Story D. C-CaFe pilot study. Macedon Ranges North Western Melbourne Medicare Local Grant, 2015. Story D, Daly O, Liberatore R, Abbey C, Blake K, Hajek J, Smith W, Ploderer B, Parker A, Kerr C. We HELP: Western e-HEaLth patient information portal for Pregnancy. Story D, Tait A. Survey Research. Anethesiology. Feb 2019. 130(2). 192-202. Darvall J, Braat S, Story D, Greentree K, Bose T, Loth J, Lim WK. Protocol for a prospective observational study to develop a frailty index for use in perioperative and critical care. Jan 2019. BMJ Open 9(1). Bampoe S, Cook T, Fleisher L, Grocott MPW, Neuman M, Story D, Myles P, Haller G. Clinical indicators for reporting the effectiveness of patient quality and safety-related interventions: a protocol of a systematic review and Delphi consensus process as part of the international Standardised Endpoints for Perioperative Medicine initiative (StEP) BMJ OPEN 8(11):8 pages Article number ARTN e023427 01 Nov 2018. Darvall JN, Gregorevic KJ, Story DA, Hubbard RE, Lim WK. Frailty indexes in perioperative and critical care: A systematic review. ARCHIVES OF GERONTOLOGY AND GERIATRICS 79:88-96 (9 pages) 01 Nov 2018. Leslie K, Story DA, Diouf E. Out of Africa: three generalisable lessons about clinical research. BRITISH JOURNAL OF ANAESTHESIA 121(4):700-702 (4 pages) 01 Oct 2018. Miles LF, Litton E, Imberger G, Story D. Intravenous iron therapy for non-anaemic iron deficient adults. Cochrane Database of Systematic Reviews 2018(8):09 Aug 2018. Darvall JN, Gregorevic KJ, Story DA, Hubbard RE, Lim WK. A frail future. ANAESTHESIA 73(8):1041-1042 (2 pages) 01 Aug 2018. Buggy DJ, Freeman J, Johnson MZ, Leslie K, Riedel B, Sessler DI, Kurz A, Gottumukkala V, Short T, Pace N et al. Systematic review and consensus definitions for standardised endpoints in perioperative medicine: postoperative cancer outcomes. BRITISH JOURNAL OF ANAESTHESIA 121(1):38-44 (7 pages) 01 Jul 2018. Yong PH, Weinberg L, Torkamani N, Churilov L, Robbins RJ, Ma R, Bellomo R, Lam QT, Burns JD, Hart GK et al. The Presence of Diabetes and Higher HbA(1c) Are Independently Associated With Adverse Outcomes After Surgery. DIABETES CARE 41(6):1172-1179 (8 pages) 01 Jun 2018. Myles PS, Bellomo R, Corcoran T, Forbes A, Peyton P, Story D et al. Restrictive versus Liberal Fluid Therapy for Major Abdominal Surgery. New England Journal of Medicine. doi:10.1056/NEJMoa1801601 10 May 2018. Abbott TEF, Fowler AJ, Pelosi P, de Abreu MG, Moller AM, Canet J, Creagh-Brown B, Mythen M, Gin T, Lalu MM et al. A systematic review and consensus definitions for standardised end-points in perioperative medicine: pulmonary complications. BRITISH JOURNAL OF ANAESTHESIA 120(5):1066-1079 (14 pages) 01 May 2018. Weinberg L, Chiam E, Hooper J, Liskaser F, Hawkins AK, Massie D, Ellis A, Tan CO, Story D, Bellomo R. Plasma-Lyte 148 vs. Hartmann's solution for cardiopulmonary bypass pump prime: a prospective double-blind randomized trial. PERFUSION-UK 33(4):310-319 (10 pages) 01 May 2018. Story DA. The Heat Is On Clinical Implications of Intraoperative Thermoregulation Research. ANESTHESIOLOGY 128(5):871-872 (2 pages) 01 May 2018. Miles LF, Kunz SA, Na LH, Braat S, Burbury K, Story DA. Postoperative outcomes following cardiac surgery in non-anaemic iron-replete and iron-deficient patients - an exploratory study. ANAESTHESIA 73(4):450-458. 01 Apr 2018. Kerridge R, Whyte I, Prior F, Luu J, Story DA. The good, the bad, and the ugly: sodium-glucose cotransporter-2 inhibitors (gliflozins) and perioperative diabetes. ANAESTHESIA AND INTENSIVE CARE 46(2):155-158 (4 pages) 01 Mar 2018. Boden I, Skinner EH, Browning L, Reeve J, Anderson L, Hill C, Robertson IK, Story D, Denehy L. Preoperative physiotherapy for the prevention of respiratory complications after upper abdominal surgery: pragmatic, double blinded, multicentre randomised controlled trial. BMJ 360:j5916 24 Jan 2018. Story DA, Leslie K, French C. Feasibility and pilot studies: small steps before giant leaps. Anaesth Intensive Care 46(1):11-12 Jan 2018. Weinberg L, Chiam E, Hooper J, Liskaser F, Hawkins AK, Massie D, Ellis A, Tan CO, Story D, Bellomo R. Plasma-Lyte 148 vs. Hartmann's solution for cardiopulmonary bypass pump prime: a prospective double-blind randomized trial. Perfusion 267659117742479 01 Nov 2017. Weinberg L, Harris L, Bellomo R, Ierino FL, Story D, Eastwood G, Collins M, Churilov L, Mount PF. Effects of intraoperative and early postoperative normal saline or Plasma-Lyte 148 (R) on hyperkalaemia in deceased donor renal transplantation: a double-blind randomized trial. British Journal of Anaesthesia 119(4):606-615 (10 pages) 01 Oct 2017. Miles LF, Story DA, Litton E. Peri-operative correction of non-anaemic iron deficiency. Anaesthesia, 2017 Jul 1, 72(7): 910-911. McGain F, Story D, Lim T, McAlister S. Financial and environmental costs of reusable and single-use anaesthetic equipment. British Journal of Anaesthesia. 2017 Jun 1, 118(6):862-869. Journal of Clinical Monitoring and Computing. 2017 Apr 1, 31(2):343-351. Leslie K, Hopf HW, Houston P, O'Sullivan E. Women, Minorities, and Leadership in Anesthesiology: Take the Pledge. Anesthesia and Analgesia. 2017 May;124(5):1394-1396. Keon-Cohen Z, Myles P, Story D. A survey of Australian and New Zealand anaesthetists’ attitudes towards resuscitation orders in the perioperative setting. Anaesthesia and Intensive Care. 2017 May; 45(3):396-402. Machan L, Churilov L, Hu R, Peyton P, Tan C, Pillai P, Ellard L, Harley I, Story D, Hayward P, Matalanis G, Roubos N, Seevanayagam S, Weinberg L. Apneic Oxygenation Versus Low-Tidal-Volume Ventilation in Anesthetized Cardiac Surgical Patients: A Prospective, Single-Center, Randomized Controlled Trial. J Cardiothorac Vasc Anesth. 2016 Dec 30. doi:10.1053/j.jvca.2016.12.019. [Epub ahead of print]. Myles P, Bellomo R, Corcoran T, Forbes A, Wallace S, Peyton P, Christophi C, Story D, Leslie K, Serpell J, McGuinness S, Parke R; Australian and New Zealand College of Anaesthetists Clinical Trials Network, and the Australian and New Zealand Intensive Care Society Clinical Trials Group. Restrictive versus liberal fluid therapy in major abdominal surgery (RELIEF): rationale and design for a multicentre randomised trial. BMJ Open. 2017 Mar 3;7(3). Weinberg L, Huang A, Alban D, Jones R, Story D, McNicol L, Pearce B. Prevention of hypothermia in patients undergoing orthotopic liver transplantation using the humigard® open surgery humidification system: a prospective randomized pilot and feasibility clinical trial. BMC Surg. 2017 Jan 23;17(1):10. McAlister S, Ou Y, Neff E, Hapgood K, Story D, Mealey P, McGain F. The Environmental footprint of morphine: a life cycle assessment from opium poppy farming to the packaged drug. BMJ Open. 2016 Oct 21;6(10). Goulding K, Peyton P, Story D, Parker A, Leslie K.Survey of research capability at Australian and New Zealand College of Anaesthetists accredited training sites. Anaesth Intensive Care 2017 Mar;45(2):196-201. Darvall J, Parker A, Story D. Feasibility and acceptability of remotely monitored pedometer-guided physical activity. Anaesth Intensive Care 2016. 44:4. McGain F, Welton R, Solley GO, Winkel KD. First fatalities from tick bite anaphylaxis. J Allergy Clin Immunol Pract. 2016 Jul-Aug; 4(4):769-70. Hughson J, Woodward-Kron R, Parker A, Bresin A, Hajek J, Knoch U, Phan T, Story D. A review of approaches to improve participation of culturally and linguistically diverse populations in clinical trials. Trials, 2016 May, 17: 263. Woodward-Kron R, Hughson J, Parker A, Bresin A, Hajek J, Knoch U, Phan T, Story D. Culturally and linguistically diverse populations in medical research: perceptions and experiences of older Italians, their families, ethics administrators and researchers. Journal of Public Health Research, Special lssue, April 2016. 5: 667, 43-51. Story D. (Open Mind) Stewart acid-base: a simple bedside approach. Anesthesia and Analgesia. 2016 Aug;123(2):511-5.